In the next few allocutions, I want to look at the four ends of the sacrifice of Calvary as they apply to us, both in our private prayer and in our participation in the sacred Liturgy. Our Lord offered himself to the Father for our redemption. The four ends of this sacrifice were adoration, thanksgiving, propitiation, and supplication. When we pray, and especially when we participate in the Holy Mass where Christ’s sacrifice is made present and offered by the Church, we should unite ourselves to the ends for which Christ offered the sacrifice of His body and blood by our prayers of adoration, thanksgiving, contrition and supplication. Today we will consider the prayer of adoration. The three persons of the Holy Trinity from all eternity and without end are in communion in a perfect, infinite act of adoration. In His prayers when he went away to a lonely place, Our Lord adored the Father and the Holy Spirit. On the cross, His sacrifice was also an act of adoration. His adoration was infinite and perfect, and thus a fitting offering to the Father, entirely beyond our capacity as mere human beings. At the Baptism of Christ, and at His Transfiguration the Father’s voice was heard “This is my beloved Son” (Matt 3.17; Mk 9.7) the agapētos, the one who is loved, esteemed and regarded as worthy of love. The Father adores the Son in a reciprocal relationship of persons within the Holy Trinity. In the Creed, we sing of the Holy Ghost who is simul adoratur adored likewise with the Father and the Son. He is also adored equally by the Father and the Son. 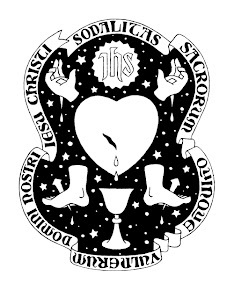 Our response to these words, signified in the traditional Mass by the bowing of the head, is our humble and poor association with the infinite adoration at the heart of the Blessed Trinity. That adoration of the Divine Persons is the supreme recognition of infinite holiness, goodness, truth and beauty. Our prayer of adoration is also an attempt to imitate as far as we can, this infinite and perfect adoration within the Holy Trinity. We can discern three aspects of adoration as offered by the human person to the Persons of the Holy Trinity. First there is a sovereign esteem. We attempt in our limited way to acknowledge lovingly, with fitting wonder and awe before the all-holy, the greatness of God. He is infinitely great in Himself, but we have also the wonder of His creation to help us in our meditation. Today we know more of the greatness of the universe than those of past ages. They were able to observe the beauty of the earth and the skies. We now know something of the immense distances over which light has travelled from the stars, the vast expanse of time over which creation has developed, and the intricacies of the working of both living and inanimate matter which can be observed through the electron microscope. Science can explain something of how the universe works. It cannot explain why there is something rather than nothing, why the universe exists in the first place, or why it exists with the laws and constants that govern its working. We can observe these things, we cannot explain how they came to be. Science itself can lead us to the adoration of the Creator. Secondly, adoration involves a profound respect for the One who is infinite and transcendent. We bow down in adoration spiritually: our physical gestures are a sincere effort to put this into action as appropriate for the human person. 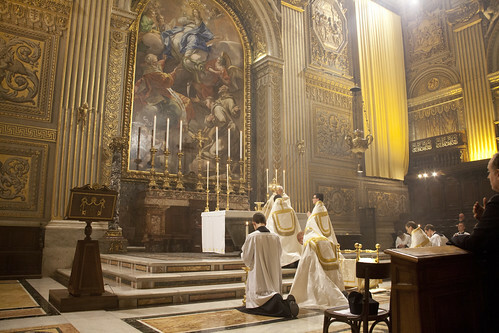 When we genuflect before the Blessed Sacrament, or prostrate on two knees when the Sacred Host is exposed, or bow at the consecration or at the words veneremur cernui, we are trying to express our respect and obeisance before the one who created us, redeemed us, and holds out to us the promise of eternal life. Like Moses who was ordered to take off his sandals before the burning bush, we realise in the presence of the Most High that we are on holy ground. Our external gestures must, of course be accompanied by our interior attitude of adoration, but they are a help to us in forming that attitude. They also help others to understand that the Church is not simply a meeting-place of the assembly but the House of God where God comes to dwell among men, a holy place in which our reverence is a fitting attitude in the presence of God. Thirdly, this profound respect should lead to our absolute submission before the living God. This is where we often fall short. The cares of life, and even our desire for entertainment or passing pleasure lead us not only to fail to give God the adoration that is His due, but even to transgress His commands in favour of our own fallen desires, wounded as we are both by the effect of original sin and the continuing effect of past sins, faults of character and habits of sin. The struggle and daily battle of the spiritual life is to order our lives and our daily actions in perfect submission to the will of God rather than our own will. This is quite clear in the teaching of Our Lord in the Gospel that we should deny ourselves and take up the cross if we wish to follow Him. At those times when we can bow down in adoration whether in the quiet of our own room, in the beauty of a landscape or best of all in the presence of the Blessed Sacrament in a quiet Church, we should ask for the grace to follow that act of adoration in our lives with a renewed submission, obedience and acceptance of God’s will as it is manifested in our lives. Sometimes we engage in a form of adoration of creatures. This can be distorted, of course, if we adore money or possessions, but it can be a good but secondary form of adoration when we acknowledge God in His creation. We marvel at a beautiful Church, such as some of our fine buildings in England. We have a sense of awe when we view the beautiful countryside with which our country is blessed, or when we hear a fine piece of music played with great skill. Some can even marvel at an elegant mathematical equation or a tight and original piece of software coding. One of the greatest examples is our instinctive adoration of a baby, a new human life born into the world, most especially when that child is brought for baptism and receives the gift of sanctifying grace. Our example in recognising the indwelling of the Holy Trinity is Our Blessed Lady who cried out in the Magnificat “My soul glorifies the Lord!” Our souls will never be able to make that cry with the same fervour as Our Lady but we may join with her as we do each day at Vespers, reciting her words in the hope that we too may glorify the Lord by our lives thanks to the grace that He has freely chosen to give us. At the Mass, we cry with the angels Gloria in excelsis Deo; our hearts join with those heavenly spirits, offering a cry of praise and glory to the Most High. Again at the Sanctus we join them in praise and adoration from the interior life of our own souls which have been sanctified by the Lord. We ask for the grace to make that cry with greater integrity as we give God that esteem, respect and submission that we owe to Him. At the Holy Mass, these prayers in which we unite ourselves with the ancient and hallowed words of the sacred Liturgy, we are truly joined with Our Blessed Lord in the greatest possible act of adoration. Let us make it the beginning and end of our prayers as we join with the angels and saints, hoping one day to be united with them in that perfect adoration which is the blissful and eternal life of heaven.